Identification: Trachemys scripta scripta (Schoepff, 1792), the Yellow-bellied Slider, has a large yellow blotch behind the eye that is most evident in juveniles and females (Ernst et al., 1994; Conant and Collins, 1998). Broad vertical bands (when viewed from the side) are often present on the carapace, the yellow plastron (lower shell) typically has round dusky smudges or none at all, and narrow yellow stripes mark the front surface of the forelegs (Ernst et al., 1994; Conant and Collins, 1998). Native Range: The Yellow-bellied Slider's indigenous range covers southeastern Virginia southward through the Coastal Plains of the Carolinas, Georgia, northern Florida and the eastern portion of Alabama (Martof, 1956; Mount, 1975; Stevenson, 1976; Martof et al., 1980; Moler, 1988; Ashton and Ashton, 1991; Gibbons and Semlitsch, 1991; Mitchell, 1994; Palmer and Braswell, 1995; Conant and Collins, 1998; Bartlett and Bartlett, 1999a; King, 2000). Other subspecies of T. scripta have been described as occurring in Mexico, Central America, Brazil, Uruguay, northern Argentina, and the Caribbean drainages of Colombia and Venezuela (Smith and Smith, 1973, 1976, 1979, 1993; Pritchard and Trebbau, 1984; Ernst and Barbour, 1989; Campbell, 1998); however, all of these are now given full species rank (Seidel, 2002). They are not covered in this account. Table 1. States with nonindigenous occurrences, the earliest and latest observations in each state, and the tally and names of HUCs with observations†. Names and dates are hyperlinked to their relevant specimen records. The list of references for all nonindigenous occurrences of Trachemys scripta scripta are found here. Status: In nearly all of its nonindigenous localities in Canada, New York, New Jersey, Pennsylvania, Michigan, Virginia, North Carolina, South Carolina, and perhaps Massachusetts, isolated populations of T. s. elegans are reproducing and thriving (Stein et al., 1980; Manchester, 1982; DeGraaf and Rudis, 1983; Harding and Holman, 1990; Cardoza et al., 1993; Ernst et Nonindigenous Yellow-bellied Sliders are established in Fairfax County, northern Virginia (Ernst et al., 1997). The status of occasional T. s. scripta found outside of their indigenous range in Florida (Bartlett, 1994) is unknown. A forthcoming assessment of the status of nonindigenous pond sliders in Florida will be made by Meshaka et al. (2003). The T. s. scripta found in Arizona and the Rio Grande drainage of New Mexico do not yet represent established populations (Hulse, 1980; Stuart, 1995b, 2000; Degenhardt et al., 1996), but future surveys are required to establish this. The records provided in this review may greatly underestimate the distribution of T. scripta in these states. The conditions under which T. scripta are "farmed" or "ranched" for the pet trade are often extremely septic (Williams, 1999). Not only does this create the well-documented threat of salmonellosis in children who receive them as pets (Williams, 1999), but it could negatively impact indigenous wild turtles when released pets spread diseases and parasites into the environment (Stuart, 2000). Pond sliders are aquatic, omnivorous generalists, which rarely leave water except to bask (Ernst et al., 1994; Brown et al., 1995; Conant and Collins, 1998; Cox et al., 1998). 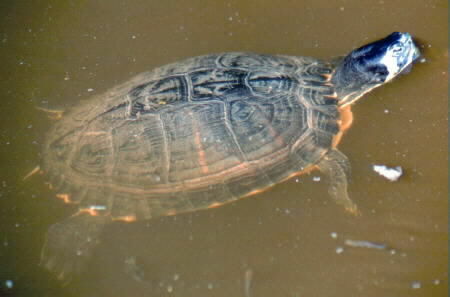 Adult turtles tend to be more herbivorous than juveniles, but both will opportunistically eat aquatic invertebrates (especially insects and mollusks), fish, frog eggs and tadpoles, aquatic snakes, and a wide variety of aquatic plants and algae (Ernst et al., 1994; Brown et al., 1995). Although they prefer quiet waters, T. elegans is highly adaptable and can tolerate anything from brackish waters, to manmade canals, and city park ponds (Ernst et al., 1994; Cox et al., 1998; Salzberg, 2000). The Red-eared Slider may wander far from water, and rapidly colonize any newly available habitat (Cox et al., 1998; Minton, 2001). In California, this ability to rapidly colonize available habitat may be aided by an extensive system of manmade canals and irrigation ditches. Females lay 2-23 eggs per clutch in a cavity dug out of the soil, and as many as five clutches may be oviposited per year (Gibbons, 1990; Ernst et al., 1994). Brennan, P. 2006. O. C. Turtles Crowded Out. The Orange County Resister. July 14, 2006. [Mathui, K.] 1985. [Amphibians and Reptiles of Japan. Shogakukau, Tokyo.] [In Japanese.] 160 pp.